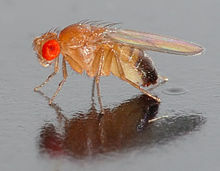 So we got into a discussion about model organisms, those that are used as a good system to be able to compare back to human beings, and in what ways they are being used. That we have to even figure out whether or not something has a genetic basis. Or maybe a good treatment option for a genetic disease. If an organism shows similar symptoms as a human disease, this will give us a better understanding on when and how the disease progresses, causes and possible treatment options. This allowed one student to immediately jump into what causes Autism. We talked about the controversy that surrounds the disorder, and ways scientists are trying to figure out the genetic basis of the disease, and how much the environment can play a role. In our current discussion, it was a perfect way for me to bring an actual example of how other organisms are being used to find out more about a specific disorder. It was shown by a group of researchers at Cold Spring Harbor Laboratory that a deletion of a group of genes on chromosome number 16 causes autism-like symptoms. 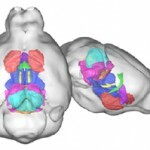 They used mouse models with the same genetic alteration to show that when fewer copies of these genes are inherited, it leads to features resembling those that are used to diagnose autism. 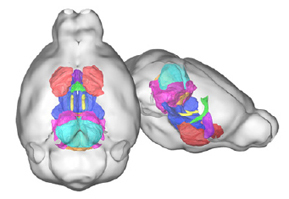 Changes were seen in the structure of the mouse brain (see image below) and in their overall behavior of the mice. Using the mouse model, they are able to mimic the disease to better understand what causes it, better diagnose it, and a new possible target for intervention and treatment. 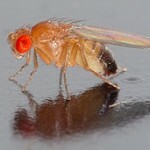 Print article This entry was posted by Jennifer Galasso on October 12, 2011 at 2:21 pm, and is filed under Your Genes, Your Health. Follow any responses to this post through RSS 2.0. You can leave a response or trackback from your own site.